Join the Innovation Spring as an IDEA Champion or contribute your talent to a team as sa FREE Agent. The time to create tomorrow’s solutions is now! Students and faculty from all disciplines welcome. Winning teams will compete in finals for $5,000 in prizes. Bring yourself-we’ll take care of the food and swag! 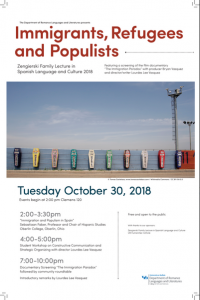 This year’s Zengierski, “Immigrants, Refugees, and Populists,” was organized in the hopes of engaging students and the communities of WNY on the current political crises being generated around immigrants and refugees in both the Americas and in Europe. Sebastiaan Faber from Oberlin College will kick off the day with a talk on “Immigration and Populism in Spain.” We have also invited independent film-makers Lourdes Lee Vasquez and Bryan Vasquez to screen their documentary, “The Immigration Paradox.” For this film they interviewed people with a variety of viewpoints on border-crossing along the US-Mexico border, and follow up with a wealth of factual information. Prior to the screening they will lead a workshop for students on “Constructive Communication and Strategic Organizing.” The film screening will be immediately followed with a community roundtable discussion featuring our guests plus Nicole Hallett (UB Law) and Meghan Maloney de Zaldivar (New York Immigration Coalition). All free and open to the public. The SUNY Undergraduate Research Conference (SURC) is a multidisciplinary spring semester event hosted each year by different SUNY institutions. It brings together undergraduate student researchers and faculty mentors from across the SUNY system for activities, including sessions devoted to student presentations—oral, performance, artistic displays, and posters presentations—in ALL academic disciplines. Farmingdale State College (SURC East), SUNY Adirondack with SUNY Plattsburgh at Queensbury (SURC Central), and Niagara County Community College (SURC West) will co-host SUNY SURC this coming April. By bringing together students and faculty from across the state, SURC helps realize the synergistic power of the SUNY system. Are you interested in positively impacting underserved communities in the City of Buffalo? Have you considered a career in education? The UB Teacher Residency Program’s Urban Teaching cohort is launching in the summer of 2019 and we are seeking applicants who are interested in working toward equity in the educational experiences afforded to historically marginalized students in the City of Buffalo. Earn initial teacher certification in Early Childhood, Childhood, English for Speakers of Other Languages, or Adolescence Education in one year. Receive an $18,000 stipend for living expenses and become eligible for scholarship support in exchange for a 3 year commitment to Buffalo Public Schools. Co-teach alongside a mentor teacher in the Buffalo Public Schools for one school year. Engage in rigorous and relevant coursework that is integrated with classroom practice. Collaborate and build a community with a small cohort of residents, mentor teachers and university faculty who are committed to improving educational experiences in historically underserved communities. *Previous education coursework is not required. To be eligible, you will need an undergraduate background in your intended content area. The priority deadline to apply is November 1st. The application requires two short essays, transcripts, and two references. (Applications received after November 1st will be reviewed on a rolling basis, contingent upon district needs and funding.) More information about the program is available at our website http://ed.buffalo.edu/residency.html. Join us at this week’s Sip and Chat for coffee, baked goods and the opportunity to learn more about UB’s #SPIRITDAY public art project hosted by the Office of Inclusive Excellence. The non-partisan public art project is based on the For Freedoms nationwide project and provides UB students with the opportunity to make their own yard sign to stand with LGBTQ+ youth against bullying. During Sip and Chat on Wednesday, October 17th from 11:30am-12:30pm, Honors Scholars can create their yard sign which will be included in a public art installation the next day outside of the Student Union. Through a partnership with the Office of Inclusive Excellence, the Intercultural and Diversity Center, The LGBTQ Faculty and Staff Association, and LGBTQ student organizations, the University has commissioned artist, queer activist, and UB alumni Dana Tyrrell to install the public art project. The project is through For Freedoms, an artist-run platform for civic engagement, discourse, and direct action for artists in the United States. In 2010 the first Spirt Day was recognized. Spirit Day is a means of speaking out against LGBTQ bullying and standing with LGBTQ youth, who disproportionately face bullying and harassment because of their identities. Pledging to “go purple” on Spirit Day is a way for everyone — forward-thinking companies, global leaders, respected celebrities, neighbors, parents, classmates, and friends — to visibly show solidarity with LGBTQ youth and to take part in the largest, most visible anti-bullying campaign in the world. On October 18 from 10am-3pm in the Student Union Lobby, students, faculty and staff will see the lawn sign installation and get to make a sign if they haven’t already. At 12pm pizza will be served and brief remarks will be shared by the artist and members of the UB community. Spirit Day will also be recognized at UB on October 20 at the UB Volleyball vs. Central Michigan match in Alumni Arena at 6pm. The first 225 guests will get a free purple #SPIRITDAY t-shirt! UB’s #SpiritDay Public Art Project October 18 FREE Pizza at Noon! Join UB’s #SPIRITDAY public art project hosted by the Office of Inclusive Excellence on October 18, 2018 between 10 a.m.-3 p.m. in the Student Union Lobby and make your own yard sign to stand with LGBTQ+ youth against bullying that will be displayed on the lawn outside of the Student Union. Spirit Day is a means of speaking out against LGBTQ bullying and standing with LGBTQ youth, who disproportionately face bullying and harassment because of their identities. Pizza lunch served at noon! Marshall University Joan C. Edwards School of Medicine Biomedical Graduate Program will have a chatroom at the upcoming BIOMED Virtual Grad School Fair. This is a great chance for you and your best students to receive information on our Biomedical Research and Clinical and Translational Science programs. Please forward this information to anyone who may be interested! For questions, please contact: carothers@marshall.edu or maue1@marshall.edu. We (Let Them LOL) has their biggest fundraising event of the year – the Water Gala – coming up next Saturday, October 20th and we still need volunteers! The basic info is: Saturday October 20th at Buffalo Riverworks starting at 3pm and going until 10 or 11pm. We will sign any and all service requirement papers. There will be an informational meeting Thursday the 18th at 7pm at our volunteer center (5205 Harris Hill Road, Willamsville), the meeting isn’t mandatory but we really encourage people to come and it will count towards service hours too! For more information, contact Hannah Griffith at hannah@letthemlol.com if interested ASAP! 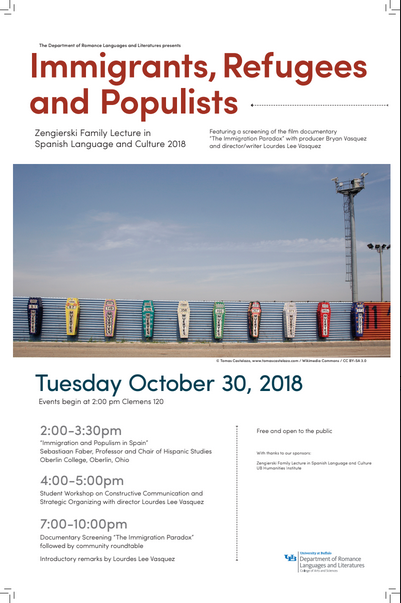 Join us for the next InFocus on Friday, October 19, 2018 at 12 noon in 107 Capen Hall (Colloquium room). The topic will be Midterms-What’s at Stake in November?